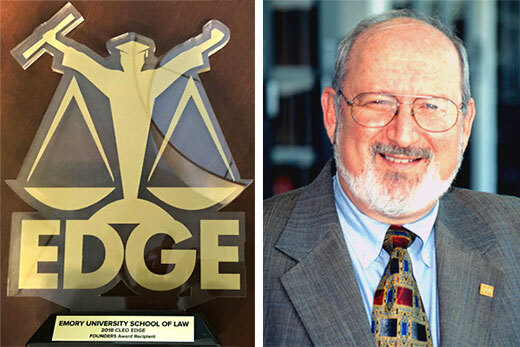 Emory Law and Professor Emeritus Nat Gozansky both received 2018 CLEO Edge Founders' Awards. Emory Law has been recognized by the Council on Legal Education Opportunity (CLEO) with a 2018 CLEO Edge Founders’ Award, in honor of CLEO’s 50th anniversary, for having significant impact on diversifying the legal profession. One hundred fifty individuals, law schools and legal organizations were recognized, from more than 600 nominations. Both Emory Law and professor emeritus Nathaniel Gozansky received awards. Shortly thereafter, Emory Law enrolled its first African American students. Their careers set milestones within the Atlanta and federal judicial communities. But while legal obstacles to admitting law students from diverse populations had diminished, economic barriers precluded many minority students from enrolling. In 1966 and 1967, armed with a grant from the Field Foundation, Emory Law introduced the “Pre-Start” program, CLEO’s predecessor, to allow minority students to attend summer legal courses. Based on this hands-on classroom training, 12 students were admitted to Emory Law’s next class. In 1968, Emory became one of four institutions to host CLEO’s inaugural summer program. CLEO established its national offices in Atlanta and, shortly thereafter, professor Gozansky became its associate director. Gozansky not only expanded the program, he navigated the political currents that threatened CLEO’s growth and future. By 1972, his and others’ work led to CLEO’s move to Washington, D.C.